Another popular style of retainer is the Essix, which looks similar to the Invisalign® tray system. These retainers are custom-made of thin, transparent plastic which is designed to fit precisely over your teeth. Their main advantage is that they're invisible, with no wire to show. These retainers are also easy to remove, but they may be somewhat less durable than the Hawleys. They aren't recommended for patients with certain conditions, like teeth grinding. Finally, fixed bonded retainers may be an option for some people, especially on the lower front teeth. As their name implies, they aren't removable by the wearer — but they aren't visible either. This system uses a wire which is bonded to the tongue side of the teeth. It may remain in place for months, or longer. This type of retainer is sometimes recommended when there's a high risk that teeth could revert to their former position. To stay fresh and germ-free, all retainers need proper cleaning. 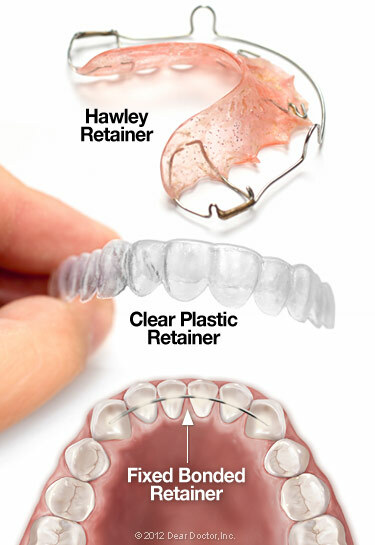 A Hawley retainer can be brushed gently with a regular toothbrush — but a brush may scratch the clear aligner types. Fixed retainers are cleaned by brushing and flossing; a floss threader or interproximal brush can also be a helpful cleaning tool when needed.